Top 5 Reasons 9/11 Was NOT an Inside Job! On September 11, 2001, at 8:45 a.m. during a clear Tuesday morning, 19 terrorists associated with the Islamic millitant group of Al-Qaeda hijacked 4 aircrafts and carried out suicide attacks against the Twin Towers of WTC and Pentagon. Often referred to as 9/11, these horrible attacks resulted in widespread death and destruction, triggering many subsequent American initiatives to combat terrorism. More than 3,000 people died during the attacks in the NY City and Washington, D.C., including more than 500 firefighters and police officers. However, just after the attacks, a lot of people started to question many of the alleged ”inconsistencies” in the official conclusions and reports, leading to dozens of conspiracy theories, which question the official nature and motive of the 9/11. In this article, we are going to look on 5 of the most frequent arguments for the alleged ”inside job”, and disprove them step-by-step, using the available evidence. 1.Fires from Kerosene are not hot enough to melt steel. According to this argument, frequently cited by the people who think 9/11 was an inside job, the kerosene fires, with temperatures well below the melting point of construction steel(2750 °F), would be definitely not capable of severely damaging the steel framework of the Twin Towers, and therefore causing them to collapse. In addition, the fact which is often ignored, most of the airplanes contain large amounts of aircraft aluminium, a mixture of aluminium and magnesium, in their wings. Magnesium does burn at 5610 degrees, which is more then enough to melt even the most durable of of steels, in fact, magnesium fire is hot enough to actually vaporize most of the metals, including construction steel! It is true, that the Twin Towers of the World Trade Center were designed to withstand the impact of any major passenger jet. And actually, they did. It was not the impact, that destroyed the Towers, in reality, Twin Towers were brought down by subsequent fires. 2. The Pentagon was hit by a missile, not a commercial plane. Nobody saw any aeroplane approaching the Pentagon. According to this widely known argument, hole in the wall of Pentagon was far too small to have been made by a Boeing 757 crash. Because of that, many conspiracy theoretics conclude, that the Pentagon was struck by a guided missile. However, the truth is much more prosaic. A crashing jet never punches a cartoon-like outline of itself into a concrete building. In the case of Pentagon, aircraft allegedly crashed in sharp angle, with one wing hitting the ground, and other being destroyed by the impact to the Pentagon’s main columns. According to further simulations, rest of the plane was simply assimilated to the concrete structure, after the crash. According to available reports, there were more than 120 eyewitnesses who saw a large jet approaching the Pentagon. Many of them reported that it was an American Airlines jet, and that the noise of the aircraft was exteremely loud. No witnesses at all reported sighting a military aircraft or guided missile. Conspiracy theorists often insist there was no aircraft debris left at the Pentagon. However, evidence suggest otherwise. There was a lot of various airplane debris scattered around the crash site, including parts of the aircraft body, engine rotor, and remnants of the gear. In addition, Boeing 757’s black box was found few hours after the crash. Seven hours after the Twin Towers collapsed, the 47-story high WTC 7 followed. According to many conspiracy theorists, the videotapes of the collapse clearly show, that it was not a collapse caused by a fire, but rather a controlled demolition. In addition, subsequently to the collapse of Twin Towers, a fifth-floor fire in the central part of WTC 7 was ignited by the debris, and burned for at least 7 hours. Because of the irreversible damage caused by the fire, WTC 7 then collapsed from the inside. Building 7 may have withstood the physical damage or the fires that burned for hours separately, but the combination of the both factors, when applied to the building’s unusual construction, was enough to start the chain-reaction collapse. According to alleged evidence, traces of thermite, a mixture of rust and powder zinc, which burns at extremely high temperatures, were found in the ruins, indicating the controlled demolition. 9/11 ground zero. Note the steel column, which appears as it has been cut. In this photo of the WTC ruins, we can see a steel column, which appears as it has been cut. Conspiracy theorists claim that it is impossible to create such a cut by a welding tool, and that it was designed to make the building fall. They also claim that the yellow substance on the side of the column is residue from a thermite reaction, which cut the column before the buildings collapsed. If we examine these claims closely, we will quickly come to a conclusion that termite was definitely not used to bring the Twin Towers down. 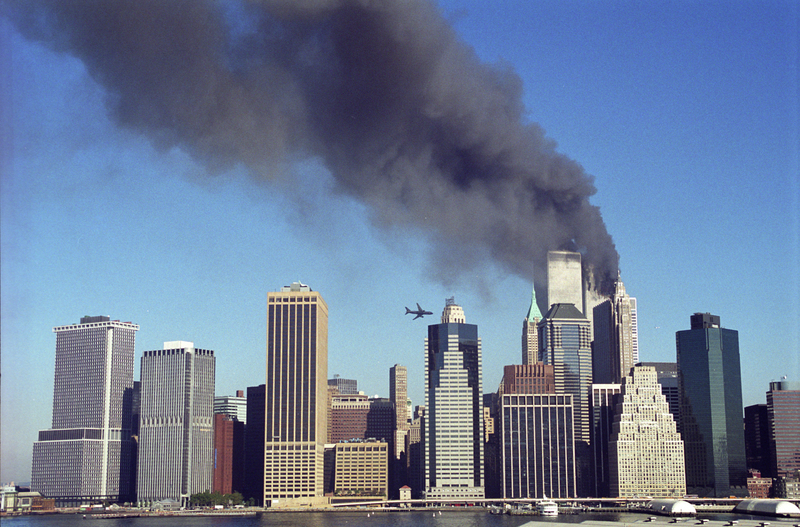 At first, the photo above was made on 10/9, nearly one month after the 9/11 attacks. At the time, cleanup of the debris was more than two weeks underway, and it is very likely that the column above was cut by workers cleaning up the ground zero. Thermite in general makes an irregular hole with many drips and blobs of molten metal around. It is not capable of making clean cuts in any way, in contrast with metal welding. The yellow smoke and residue is often left after gas welding, and it has nothing to do with thermite. In comparison, thermite residue is always black colour, sometimes with slight tones of red. 5. During the collapse of the Twin Towers, puffs of dust and debris were ejected from the sides of the buildings. When we look closely on the videotapes of the Twin Towers collapsing, we can notice that there were several isolated ejections of dust and debris from the Towers during their collapse. Conspiracy theoretics often consider this to be one of the most direct pieces of evidence for the controlled demolition of the Towers. This argument can be easily refuted in many different ways. Like the vast majority of other office buildings, the Twin Towers were mostly composed of air. After the Towers started to collapse, upper floors were gradually falling on the lower, creating a pancake effect. During the collapse, small geysers of concrete dust were ejected from the opened office windows in the lower floors, because of the pressurized air. The built-up air pressure during the collapse of Twin Towers was maybe not enough to blast windows, but it was definitely sufficient enough to blow the pulverized concrete out of the windows which had been already opened. In addition to that, somebody would definitely notice the massive amounts of explosives being brought to the Twin Towers before the explosions. It would be extremely unpractical, and the sheer amount of people working in the Twin Towers every day makes this scenario virtually impossible. In addition, to wire the Towers with explosives, US Government would need to hire hundreds of people to do the job. Possibility of unwanted information leaks would be extreme. However, even with the ”inside job” theory being blown to pieces, there is still a small possibility that US Government was really behind the 9/11 attacks. It is not very likely, but they could have a wide variety of political and economic motives to destroy the Twin Towers. In reality, no guided missiles, explosives or thermite are needed, hiring a group of terrorists to do the dirty work for them would be more than enough. As famous English writer Alan Moore once said, “The most important thing that I have ever learned about the conspiracy theories, is that conspiracy theorists believe in a conspiracy because that is more comforting for them. The truth of the world is that it is chaotic. Not the Jewish banks, The Illuminati, and not even the Grey Aliens are in control. However, according to many conspiracy theorists, all the U.S. landings on the moon were faked, and all the photos and videos were made only on the film stage. The results of recent survey have shown, that about 20% of Americans still believe to this day, that the United States of America never really made it to the Moon. In this article, we are going to look on 5 of the most frequent arguments for the moon landing hoax, and disprove them step-by-step, using the available evidence. According to this argument, frequently cited by the people who think that the moon landings were nothing more but a hoax, is that the star-spangled banner of the United States of America seemed to wave and flutter as Neil Armstrong planted it to the ground. This wouldn’t have been much of an issue except for the fact that there is virtually no atmosphere on the moon, and therefore no wind whatsoever to have such an effect on any flag. 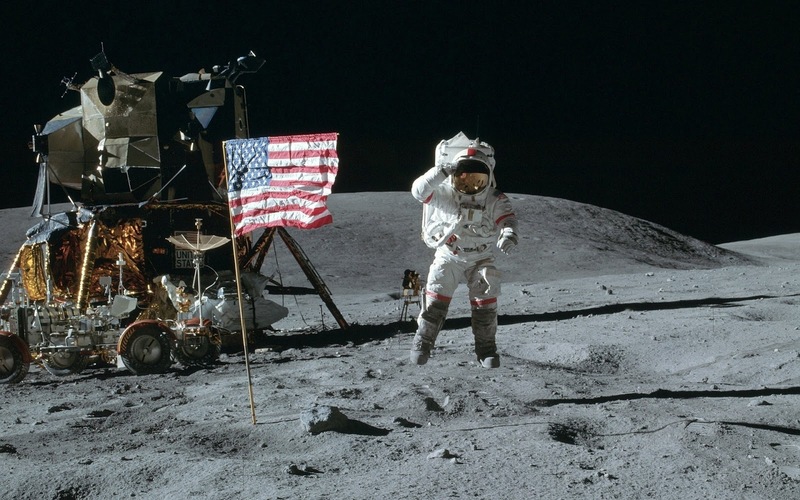 However, if we look closely on the original moon landing footage, we can see that the flag is actually standing still, and not moving in any way during the entire tape. But why is the flag still? To make the flag stand still on the moon, the flag was actually made from plastic material, similar to the one that tents are usually made of . For practical reasons, the flag was originally folded to maximize space and stored in a thin tube. After Neil Armstrong planted it to the surface of the Moon, it briefly appeared to move as it was unfolding itself to its final shape. On the moon, there is only one light source sufficiently strong to form shadows; the Sun. So it is solid to suggest that all shadows on the Moon should run parallel to each other. However, this was apparently not the case during the moon landing. Most of the photos and video recordings clearly show that some shadows fall in different directions. Conspiracy theoretics often suggest that multiple sources of light were present, and that all the landing photos and videos were taken in a film studio. According to this widely known argument for the fake moon landing theory, the astronauts would not be able even to survive their trip after receiving a lethal dose of radiation, both from the Van Allen radiation belts surrounding the Earth and solar radiation beyond Earth’s magnetic field. However, the truth is, during their entire voyage to the Moon and back to Earth, Armstrong, Aldrin and Collins only received amount of radiation equal to about 0.1% of the deadly dose. Their total exposure was approximately 11 milisieverts, and radiation dose lethal to an average human being is aroung 8,000 millisieverts. The harmful effects of radiation are based both on its strength and the time of exposure to its source. Average human would need to spend nearly four months inside the Van Allen belts to accumulate a lethal dose. The astronauts managed to pass through them during less than one hour. Regarding the time spent out of Earth’s magnetic field, where the astronauts were exposed to solar radiation, an average human could endure a radiation exposure equivalent to one-way trip to Mars and still not receive a dose which exceeds lifetime levels set up by NASA. The true reason you can’t see the stars in photos and videos of Moon is not that the stars aren’t there, but rather because of the omnipresent sunlight and the exposure limits of cameras. When these photos were taken, it was full daylight on the Moon. Because there is only an extremely thin atmosphere on the Moon,the sky appears black. In addition, sunlight at the Moon’s surface was incomparably strong with the starlight; the stars simply faded in comparison with the sun. If the astronauts used sufficiently long exposures, stars would, indeed, be visible. Even with all of our telescopes on Earth and the incredibly powerful Hubble Telescope, none of them has ever taken any pictures with any of the landing sites of the Moon. This often misleads us to the thought: are they really out there? It is true that even our most powerful telescopes aimed at the landing sites wouldn’t see anything. However, not because the Moon landings didn’t happen. It is only because of the optical limitations of telescopes themselves, because of their limited size and distance from the Moon. Even though the Moon is much closer than any other major astronomical object, Hubble Telescope still cannot register any object on the moon smaller than four metres across. However, it’s not true that we have no satellitte pictures of the moon landing sites. 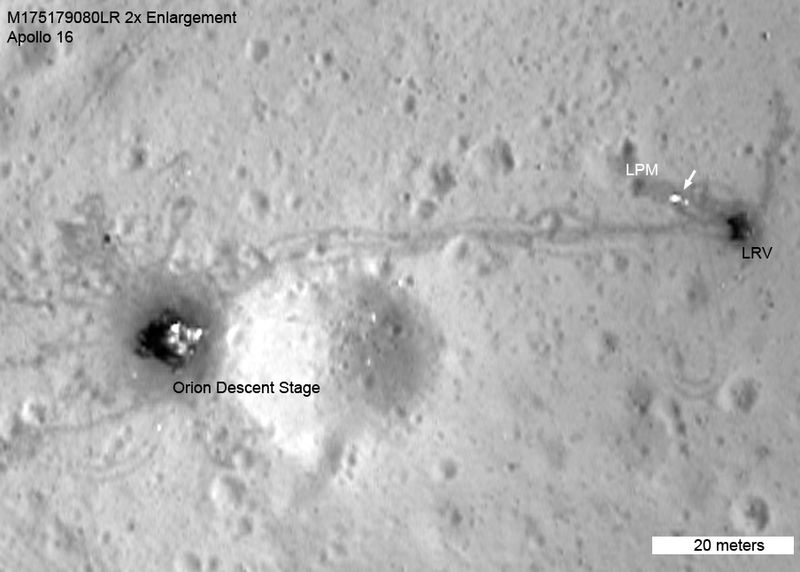 In fact, we have a number of satellittes orbiting around the Moon which have taken many pictures of all the landing sites before. 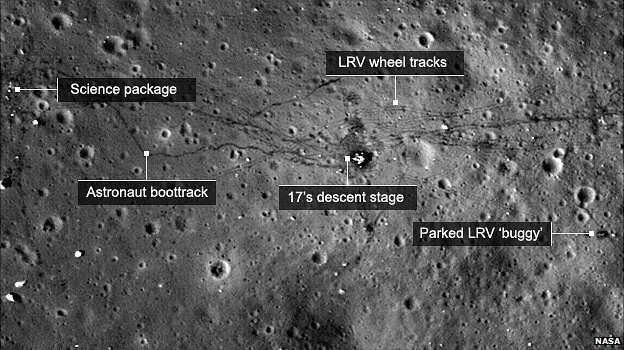 These images clearly show the equipment left on the moon by astronauts, their footprints, and all the wheel tracks left by their moon-buggies. During the entire Apollo program, the Soviet Union closely monitored all the transmissions of the astronauts. They would have been absolutely delighted to find it was a hoax. It would have been the greatest propaganda coup of all time. But apparently, the Soviets also didn’t find any solid evidence of faked moon landings.